Periodontal Therapy focuses on three areas: 1) Treating the signs and symptoms of gum disease, a critical concern for dental health; 2) Maintaining healthy bone levels in your upper and lower jaw; 3) Maintaining healthy ligaments in and around your mouth and jaw. Too often, patients wait too long between visits and by the time they see us, gum disease has quietly advanced with no pain or obvious symptoms. By the time we catch it, significant damage has been done to the bone holding the teeth. This is why it’s so important to see us regularly, and to brush and floss regularly. 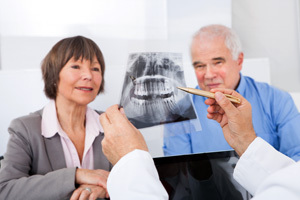 Even more concerning, gum disease not only affects the mouth and teeth. The infections that arise from gum disease can contribute to other health problems such as heart disease and diabetes.